Teacup Yorkie Care. Care of Teacup Puppies. MICHAELANGELO, GORGEOUS YORKIE MALE TINY TEACUP. ONLY 12 OUNCES AT 9 WKS OF AGE. TEACUPS NEED EXTRA SPECIAL CARE. 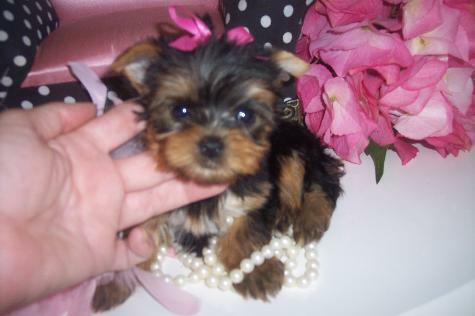 Hi and Welcome to Yorkiebabies.com Some of the Most Beautiful Teacup and Toy Yorkies in the World. Important Information about your new Teacup Yorkie and Teacup Puppies. Please Print this page. Your new Yorkie Puppy is like bringing home a newborn baby, here are some Important Tips. If you have a pool, please either keep it covered or get a child gate. So many Yorkies die each year in pool accidents. They can get in the pool but are so short legged they cannot get out. Please remember that a Yorkie puppy does not understand the danger of this situation, please protect them with child gates. This is a must. Yorkies have many cat like qualities. They like to jump. Never let a little Yorkie jump off the couch or off the bed. They can break a leg or a worse situation may ensue. Get a childs playpen instead of Training Crate. Little puppies must have their nap times. If you have young children you must supervise your children when holding or playing with little Yorkie Puppies. Teach them the proper way of holding your new puppy and sit on the floor so they dont drop your new little puppy. Childproof your house. Unplug electrical cords, keep wires from tv's and stereos out of their reach. No bones, No greenies, they can get stuck in their throats and choke. Certain plants are poisonous to puppies and dogs. Keep live plants away from your new puppy. Macadamia Nuts are bad for dogs, dont give them nuts. Chocolate is bad for dogs and puppies. Dont give them Chocolate. Keep antifreeze away from dogs and puppies, it is lethal. In Florida we have what is called the "bufu" toad. They are deadly to dogs, puppies and cattle even. During rainy season in Florida which is May to September, these toads are out in abundance. A puppy or dog let out at night to do their final "business" may sniff at a tree or bush where toads hide at night. These terrible toads can emit a poison from the back of their heads not even looking at the dog and kill it. I lost one of my multi champion line 10 month old Shih Tzus, our beloved Coco, to these terrible toads. We rushed her to the emergency animal hospital but it was too late, she died 3 hours later and suffered a terrible death. I dont let my dogs out after dark, you should be careful about doing so also if you live in south Florida. Love your dog and put newspapers by the back door or use a potty park. This happens to many people every year in Florida. Be extremely careful please! If you catch this immediately upon happening, immediately rinse your dogs mouth out with running water, but do not let the dog swallow the water. Go to a 24 hour emergency vet immediately. If you have a cat also, get it declawed. 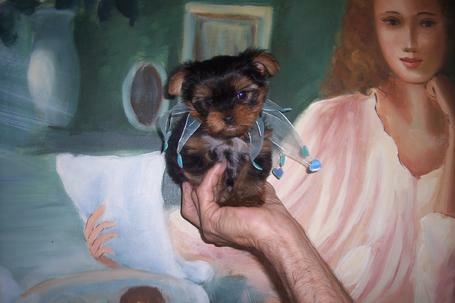 Dont use collars on these little breeds, many Yorkies die at age 6 or 7 due to collars while walking them on leashes. They get collapsed tracheas. Be kind and use a body harness or harness dress or vest instead. Only wash puppies in a tearless puppy shampoo or Johnson and Johnson baby shampoo. Either way, make sure it is tearless. Blow dry them thoroughly after washing so they dont catch cold. I do Not like puppy pads, they contain synthetic fibers which can be dangerous and even lethal to little puppies. If a puppy chews one of those puppy pads and those fibers in the pads get caught in their throat, they can die. I am old fashioned, use regular newspaper, it's safer. Keep your puppy away from other dogs and puppies until they have had all their vaccines including their first Rabies Vaccine. That means no doggie parks, no doggie beaches, no multi dog training classes until the Rabies Vaccine has been administered. Puppies can pick up all kinds of things from other dogs and you dont know where those other dogs or puppies may have been or what they may have and carry and could pass on to your new puppy. Be protective of them and they will reward you with years of love and protection in return. IMPORTANT VACCINE INFORMATION!! OUR VETS DO NOT RECOMMEND THESE VACCINES FOR TEACUP DOGS. WE ARE PASSING THIS INFO TO YOU. NO LEPTOSPIROSIS VACCINES for any toy breed puppies or dogs. It may be very dangerous for small breeds. All good vets know this. Remind them Not do this vaccine. NO LYME VACCINES, this vaccine has killed even large breed dogs. It is not necesary. Use Frontline Plus as a preventative for fleas and ticks. Use Heartguard to protect against Heartworms which come from being bitten by mosquitos. NO THREE YEAR RABIES VACCINE. Only get the one year rabies vaccine! It is too powerful for the smaller breeds. It is better to go every year than to take chances with your beloved dog. We use Royal Canin Mini Puppy Dry Food. We have tried many different foods in the past and find this one to be the best. We have tried all of them, Science Diet, Iams, Eukanuba, All Natural Foods etc. and we feel our puppies have been healthier with Royal Canin Mini Puppy Dry Food. You can get this at Pet Smart. It is sometimes hard to find at other places so just try Pet Smart or order online. With this said, food should be left out 24/7. Change food and water in the mornings and at night again around 5:00 PM. Puppies should eat 5 to 6 times a day, an average of every three (3) hours to help prevent hypoglycemia. Dont worry your puppy will Not get fat. They are young and wont overeat. As a matter of fact dogs feeling deprived of food overeat. You must be sure your puppy is eating frequently. Hypoglycemia is preventable. It is up to you to make sure your puppy is eating. We do Not cover hypoglycemia for any reason. Food should be left out in their playpen or crate evenings too. They Do need to eat during the night. I would suggest you get up during the night for the first few days to check on your puppy and to see if it has eaten. We do not agree that All Natural Foods are better for puppies, as a matter of fact, just the opposite we found was true. Puppies need the extra vitamins and nourishment in a good premium dry food like Royal Canin Mini Puppy. It is a little more costly than other dry dog foods but I highly recommend it. Please do Not change foods because then puppies get diarreah and then like a domino effect, other problems can ensue. Nutrical should be given only once per day After eating. It is a vitamin supplement, not a substitute for eating. It can serve as an excellent training treat also. Also regarding treats, I limit my treats for my dogs. I actually give unsalted saltines to my adults as a treat. I do not have to worry about what may have been, or will be on the next food recall list. My dogs like them just as much. A good treat for puppies is Biljac Liver Treats, it comes in a small size little milk carton like we used to have in school. 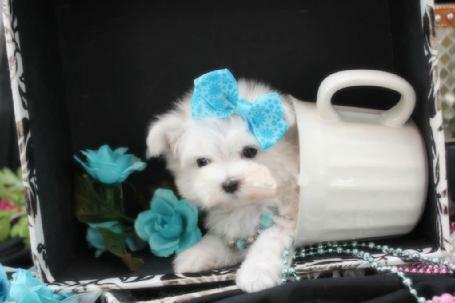 If this is a small teacup or small toy size puppy, crush the little treat so your puppy wont choke. Always have a few cans of Royal Canin Mousse, canned food, on hand in case of an emergency. This can be obtained at Pet Smart too. We continue to add more important information for you as time goes by so check our website often. And remember also to print this page off as well as our Puppy Shopping List! Unsafe Food for Yorkies, Maltese, Shih Tzus and Teacup Puppies. Table Scraps (in large amounts): Table scraps are not nutritionally balanced. They should never be more than 10% of a dog’s diet. Fat should be trimmed from meat; bones should not be fed. Chocolate: Can cause vomiting, diarrhea, seizures, hyperactivity, coma, death and increased thirst, urination and heart rate can be seen with the ingestion of as little as ¼ ounce of baking chocolate by a 10-pound dog. A dog can consume milk chocolate and appear to be fine because it is not as concentrated, but it is still dangerous. Onions, Chives & Other Spices: If fed in excess can lead to GI upset, damage red blood cells and possibly cause anemia. Coffee, Coffee Grounds, Tea and Tea Bags: Drinks and foods containing caffeine can cause many of the same symptoms as chocolate. Animal Fat & Fried Foods: Excessive fat and grease can cause pancreatitis. Chicken Bones: Bones can splinter and choke or damage a dog’s internal organs. Cooked Fish: Do not feed Tuna due to its high mercury content. Be careful of small bones in any fish. Raw Fish: Can result in to vitamin B deficiency leading to loss of appetite, seizures, and in severe cases, death. More common if raw fish is fed regularly. Nutmeg: Nutmeg can cause tremors, seizures and death. Alcoholic Beverages: Can cause gastrointestinal irritation, drunkenness, tremors, difficult breathing, panting, coma and even death. Tobacco: Affects the digestive and nervous systems which can result in rapid heart beat, collapse, coma, and death. Antifreeze & All Household Chemicals: Some of these substances such as antifreeze actually taste good to pets and can cause serious illness and deathGrapes and Raisins: Can cause kidney failure in dogs. A little as a single serving of raisins can kill a dog. Tomatoes: The fruit is not a problem in moderation, the leaves, stem and unripe fruit are. Ingestion of these can cause GI upset, excess salivation, drowsiness, dilated pupils, and weakness. The same symptoms can be seen with the ingestion of any green plant parts of the potato and many household plants. Tomatoes can cause tremors and heart arrhythmias. Tomato plants are the most toxic, but tomatoes themselves are also unsafe. Macadamia & Other Nuts: Can cause weakness, muscle tremor and paralysis. Avocados: The fruit, pit and plant are all toxic. They can cause difficulty breathing and fluid accumulation in the chest, abdomen and heart. Apples, Cherries, Peaches and other fruits: The seeds of these fruits contain cyanide, which is poisonous to dogs as well as humans. Unlike humans, dogs do not know to stop eating at the core or pit and will easily ingest them. Pepper: Can irritate the skin, eyes, nose and gastrointestinal tract. Salt or Salty Foods: Can result in sodium ion poisoning with symptoms of regurgitation, tremors, excessive thirst, diarrhea, high fevers and seizures. Small amounts of natural salt can be healthy but excessive salt intake can cause kidney problems. Sweetener: From candy and gum can also cause a fairly sudden drop in blood sugar, resulting in depression and seizures. Spoiled Foods: May contain pathogens, mold, and mycotoxins that can cause GI irritation, tremors, seizures, and death. All food, regardless of shelf-life claims, loses value and may grow toxins over time. Yeast Dough: The yeast dough can cause two problems in that as it rises, the dough can expand the GI tract, possibly causing the intestine to rupture. The yeast can also form alcohol as it rises, leading to alcohol poisoning. Your human children, if you have any, are probably gleeful that the new Yorkie is finally home. Your other animal companions, however, may be much less enthusiastic. Your task is to make the introductions and make sure the interactions don't get out of hand. The presence of the puppy alone is going to introduce stress for your other animals until they figure out what they're going to have to deal with. To make the stress as minimal as possible, choose a relatively quiet time and location to introduce your animals to one another. Here's a peek at normal canine greeting rituals. In addition to sniffing, you may see a lot of bluffing: the showing of teeth, raising hackles, and shoulder pawing. Don't panic, even though your older dog may look like he's just barely tolerating the precocious puppy skidding around him. Your dogs are doing what dogs do when they first meet: sizing one another up in order to determine who's dominant. It's an essential first step if you ever hope for harmony in your dogs' relationship. If your other dog is much larger than your Yorkie, the shoulder pawing may be a problem just because of the sheer weight and power of the bigger dog. To reduce the risk that your Yorkie will get hurt, be extra vigilant. In fact, if you have a much larger dog � especially one who still displays puppy behavior himself, is very exuberant, or isn't particularly well trained � a Yorkie probably isn't a good choice for your family. Stay close by but don't interfere unless you think that the bluffing is escalating to aggression. Your dogs have to come to their own conclusions about each other, and they can't do that with you cooing "Be nice" like a mantra or pacing back and forth, wringing your hands. If you're not sure how your older dog is going to react, put both dogs on leashes before the introduction and have someone there who can help you pull the two dogs apart if things get out of hand. Don't force the dogs to interact. Some dogs rush up to sniff at the new puppy; others stand back and observe for a while. Similarly, when your older dog is ready to leave, let him. Don't force him to stay and submit to any more juvenile antics. If the puppy tries to follow him, hold the pup back. � Don't hold the puppy up for introductions. Height equals status to dogs. The higher dog is the more dominant one. So let the dogs greet each other at their natural levels. � To help your older dog come to terms with the new arrival, reinforce his dominant status by greeting him first and giving him the most attention. After your dogs settle the dog hierarchy and accept their individual status (as either dominant or submissive), your home is going to be pretty peaceful. But as your puppy grows and her personality becomes more apparent, the dynamics between the two dogs continue to shift. Occasionally, they get along fine; other times they snap and argue with one another. You usually see these upsets at hot spots � places where dominance challenges are likely to happen: food dishes, doorways, favorite pillows, treat time, and so on. When you have a Yorkie, especially if your other dog is much larger, be aware of where the hot spots are so that you can eliminate any problems or intervene if things get rough. For example, you can feed the dogs separately, if necessary. Maybe your cat will become great friends with your new puppy (a likelier scenario if she's a kitten when he's a pup). Maybe she'll consider him nothing more than a toy to wind up and let go. Maybe she'll avoid him entirely. As unfair as the situation may be from the canine perspective, the creature in control of this relationship is the cat. Why? Because she doesn't have to stick around any longer than she wants to, and she has the tools (speed and agility) to escape. The introduction between your puppy and your cat is likely to be brief, consisting of however long it takes the cat to decide she's seen enough � an opinion she may very well form from the top of the refrigerator without bothering to get up close and personal. Keep the puppy on a leash when the cat comes near. If the cat runs, your Yorkie may give chase. If the cat hisses or swats at your Yorkie, stay calm. Don't scold her and don't baby him. Simply call an end to the introduction (if the cat hasn't done so already). When your cat is ready to leave, let her go. The goal of the first meeting is simply to make introductions, not friends � yet. That may come with time (and without your interfering). And if all you manage to achieve is noncombatant status, that's fine, too. If you have birds, gerbils, hamsters, iguanas, geckos, or other such pets, you need to make introductions (that is, let the animals see one another) only if you let the other critters out to roam the house � even if they roam in a critter cruiser � or if your Yorkie can access their living environment. Introduce them to each other a few days after your puppy's homecoming, when she's had a chance to get used to her environment but you're still closely supervising her. Make sure you don't unintentionally encourage inappropriate behavior. Laughing at her behavior, trying to coax her out of it, or giving her anything she can construe as positive attention will give her the impression that jumping and barking at the guinea pigs in the guinea pig cage is just A-okay with you. Instead, say "no" in a firm voice and take her away from the cage. If she persists, give her a few minutes of timeout in her crate. Remember that Yorkies are terriers, originally bred to hunt rats. A small animal � especially one who runs away � is an almost impossible-to-resist temptation. Unless you train your Yorkie to leave your small pets alone � and she's consistently proved that you can trust her � never let your small critter run free when your Yorkie's around and unsupervised.